I’m kind of famous amongst my extended family for going to crazy-long performances. And it’s true that I’m no stranger to six-hour operas and four-hour plays. But not everything I see is that long, and I certainly don’t think that everything should be that long. Indeed, there’s something sweet and clean and refreshing about being short and to the point. 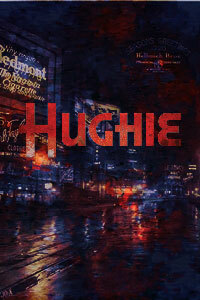 Take Eugene O’Neill’s Hughie, for example. With a running time of only 55 minutes, I was in and out of the theatre and back home earlier than I often get home on an ordinary worknight! Awesome. The great thing is that those 55 minutes were all that O’Neill needed to tell his tale. The play is a model of tight, rigorous composition. It reminded me of the best of the classical Greek or French tragedies, where there’s only enough to accomplish the purpose of the play — no more, no less. Essentially, the play presents the first meeting of two men in a hotel lobby: One, a guest, is a seedy gambler returning late; the other is the the night clerk at the front desk. I say meeting, but I should probably qualify it with quotes — “meeting” — because they never really meet each other. Not in a deep, meaningful way. Their bodies are in the same room, and they talk to each other; they even sometimes listen to each other. But their minds never meet. Each man lives in the world of his own mind, and the play achingly depicts how those two worlds never meet, even when in any other context you’d say they did meet. It’s almost depressing. Indeed, for most of the play it is depressing. The men’s failed communication emphasizes the essential loneliness of being an individual person — how you can never really get outside yourself to really experience another person. We think we make connections and have meaningful relationships, but what if it’s just an illusion we’ve created in our own minds? A story that we tell ourselves that bears no relation to the story that the other person is telling himself? If the play had ended at 50 minutes, it would have left us in a bleak state indeed. But, instead, during those last five minutes the O’Neill shifts the fit: he never lets the two men connect in any real way, but he mitigates their terrible loneliness by allowing them to discover how the story in one man’s mind fits with the story in the other man’s mind, so that each gets from the other exactly what he needs (even though the other never realizes exactly that that’s what he’s giving). It’s just a little shift, but it’s all that is needed for each man to feel like he isn’t alone after all. A bleak world, to be sure, but not without hope.